What can I send to Spain? What items are restricted? Shipping to Spain is an excellent option if you want to spend a prolonged period of time in Spain, or if you want to relocate there. In these instances, excess baggage can be a pricey problem. Flights to Spain may be cheap enough, but sometimes your baggage allocation isn’t much, which is where shipping to Spain with Send My Bag comes in. If you’re looking to spend your summer working in the bustling bars of Ibiza or Mallorca, or if you want a golfing break at one of the top resorts in Spain, such as the PGA Catalunya or Valderrama, we are here to help. You don’t have to worry about excess baggage charges, hassle at airport check-in, or lugging heavy baggage around, especially if you’re relocating or have outdoor equipment to bring with you. Here at Send My Bag, we will pick up your items at your door and drop them at your destination accommodation, ready for your arrival. It's not just holidaymakers who need to transport several items to Spain. 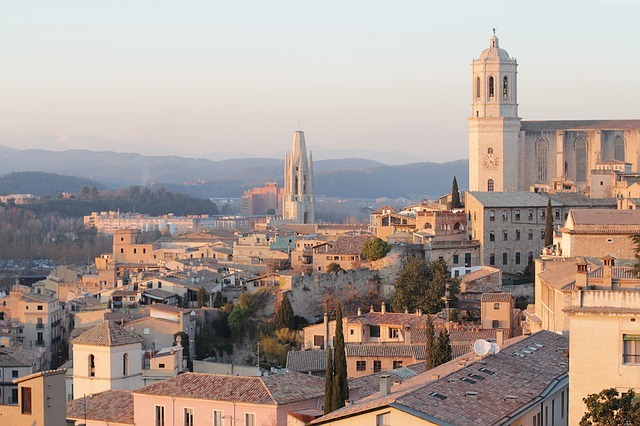 Many students choose to study in Spain for their full course or for just a term as part of a scheme like Erasmus. Or students might decide to spend their third year abroad teaching English in a Spanish school. Students will need to send several bags of their possessions to Spain in order to set up home abroad. Shipping to Spain allows students access to many more of their possessions than if they limited themselves to what they could check into the plane's hold (at considerable cost). You can also send a parcel to Spain with Send My Bag and send a care package home, or have forgotten items sent to you in Spain. You can send your luggage and boxes to Spain with Send My Bag. If you are taking a short break in Spain, if you are working there for a year, or are moving there permanently, you can save yourself a lot of hassle by sending your possessions with Send My Bag. This way, you can bring with you lots of your home comforts and keepsakes to make Spain feel a bit more like home. You can also rest assured in the knowledge that your possessions are being looked after for you, allowing you to get on with exploring your new surroundings or enjoying a spot of sunbathing. Send My Bag has numerous international routes, with a great-value flat rate for each route up to a massive 30 kg. This means that you can bring all your favourite things with you to help you set up home abroad. To learn more about sending luggage to Spain, visit our ‘How it works’ page, or our ‘FAQs’. Spain is a very popular destination for golf holidays. The country boasts many great golf courses, such as PGA Catalunya, Real Sotogrande and Real Valderrama. It's easy to send golf clubs to Spain with Send My Bag. This will make it much easier to travel to Spain, without dragging large golf bags behind you. You will also avoid any oversized baggage fees from your airline. It is great to be able to play golf using your own golf clubs, rather than borrowing some, so consider sending your golf clubs with Send My Bag. See further information on how to send golf clubs with Send My Bag, including how best to package your golf clubs. You can send your bicycle to Spain and enjoy cycling through Spain's countryside or in one of its bike-friendly cities. Sending your bike to Spain is much easier than checking it into the hold of your plane. You will avoid oversized baggage fees and won't have to carry the bike to and from the airport. Your bike will need to be taken apart and properly packaged before being sent to Spain. Check out our information on bike shipping to find out more. If you are attracted by sunny Spain and are moving there permanently, you will have to consider international removals to Spain in order to transport all of your possessions. Before you hand over anything to the movers, however, ensure that all your items are carefully packaged so that they won’t get damaged in transit. Use suitable packaging for your items and seal everything up well. If you are spending a year or a term studying in Spain you will need to transport your course textbooks and many other everyday items, such as clothes, games and DVDs, to Spain. There are a number of top universities in Spain to choose from, such as the University of Barcelona, Universidad Autónoma de Madrid and the University of Complutense Madrid. Read more about student shipping on our student removals page and find out how to receive your 10% student discount. It is easy to send a parcel to Spain with Send My Bag. This is a great option if you have left something behind at home. You can just ask a friend to pop it in a box and send it on to you. Or your friends and family might want to send you a care package to Spain to help remind you of home, or even Christmas and birthday presents. This is a great idea for expats who have gone to settle in Spain or for students who are feeling a bit homesick. Send My Bag can send parcels internationally to Spain for you. Make sure you choose a sturdy box when sending a parcel to Spain and tape it up well so nothing gets damaged in transit. Also make sure you are aware of rules regarding personal effects and brand new items (see below). Find out more about sending a parcel to find out what you can send with Send My Bag and how to package your items. Air freight is one way you could send big bulky items, such as a table or armchair, to Spain. Sending items by air freight usually takes one to two days, which tends to be faster than sea freight shipping, but typically more expensive. The amount you will have to pay will depend on the weight and size of your shipment. You will probably also have to use the services of a customs agent to handle customs clearance for you. And, you need to get your items to and from the airport. Costs could, therefore, quickly mount up. If you send internationally by air freight to Spain your items will likely arrive at one of the major airports, such as Madrid Airport, Barcelona Airport or Palma de Mallorca Airport. Instead of air freight, you could choose sea freight or container shipping to transport your possessions to Spain. This is a good option if you don’t need to receive your items immediately. Again, this option is usually used when shipping large bulky items, such as a dining table or a car. Sea freight usually means shipping items in large containers loaded onto cargo ships. It can be less expensive than air freight, but you will still need to use the services of a customs agent and will need to sort out how to get your items to and from the ports. So, the cost could be more than expected. When using container shipping to Spain your items will most likely arrive by ship at one of the major sea ports, such as the Port of Barcelona or the Port of Seville. After having the boxes returned I thought that everything would keep going to be a disaster, but I am really grateful with the awesome Customer Service they have. I sent all my belongings (8 boxes and 2 suitcases) from the United States (Lake Charles, Louisiana) to Spain (Balearic Islands) and even though the boxes arrived really damaged and most of them broken, I am happy that everything is here safe and sound. Customer's should ensure that the name of the shipper and receiver on their order are the same, and match the name on any uploaded documents. If the shipment is to be collected from or delivered to another person, this should be noted as the owner of the goods name and 'care of' or 'C/O' the name of the person who is handing over or receiving the shipment. For shipments entering Spain temporarily such as for a vacation, or being returned by a Spanish citizen who was temporarily abroad for less than one year, Spanish customs only permit up to 35kg of luggage to be cleared duty free. Shipments exceeding this weight that are not being imported for the reason of study or relocation, with all relevant documentation provided, will incur duties and taxes will be billed to receiver on delivery. If the consignee is a Spanish citizen, a copy of their DNI card will need to provided, along with a copy of their passport and flight ticket showing entry into Spain. If the consignee is not a Spanish citizen, a copy of their NIE card or Visa will be needed along with a passport copy and proof of entry into Spain, such as their flight ticket. If the consignee is staying in Spain longer than 3 months, they will need to apply for an NIE and register this with their relevant local Tax Office or Police Station in Spain prior to shipping. Should the length of stay be under 3 months, and therefore no DNI or NIE is present, only a passport will be required. Consignees will need to provide a written statement to Spanish customs detailing what their Personal Effects are for and why they are being shipped to Spain. This written statement can be automatically downloaded from your Send My Bag account based on the reason selected for shipping. If the consignee is shipping to Spain for study they may be required to provide their visa or NIE number, and enrolment or placement letter for customs clearance. If shipping to Spain for relocation, customs may request the consignee to provide a registration certificate (Certificado de Empadronamiento) obtained from the town hall in the town / city where they are residing. Spanish Citizens relocating back to Spain after more than one year abroad may also be required to obtain a Baja Consular from the Spanish Consulate or Embassy in the country they were residing as proof of their residence outside of Spain. When shipping to Spain, the declared value of the shipment should not exceed 150€. If the shipment exceeds 150€ or the shipment contains non-standard personal effects, such as tools or products of a commercial nature, the shipment will be assessed for duty which can be levied at the discretion of Spanish authorities. Customers may be required to pay an additional c. €36 processing fee upon delivery of their shipment directly to the driver. Storage fees may also be applied to shipments which are held awaiting further documentation from the customer. As most countries offer a generous duty free allowance for personal effects, the majority of Send My Bag shipments worldwide will not be intercepted by customs. Personal effects are usually considered to be used items which have been in the sender's possession for 6 months or more. If your bag is stopped by Spanish customs and is found to contain brand new or commercial items your shipment may be assessed for customs duties and taxes. If you are sending Christmas gifts please check with Spanish customs so you are aware of potential customs duties, follow their advice and attach all necessary documentation. Customs processes and allowances do vary by country and, therefore, we advise all travellers to take 5 minutes to check how their personal circumstances and what they are sending will be assessed under the prevailing customs regulations of the destination. To find out more, check out our customs information page. In order to demonstrate your shipment consists of personal effects, you will be required to complete a brief non generic packing list online, entries to be made in the format: "5 x Cotton Vests, 2 x Pairs of Shoes, 3 x Woollen Jumper" and so on rather than as "10 x Used Clothing". Spain, like the rest of the EU, allows gifts to enter the country duty and tax free provided the value does not exceed €45. In the event a consignment declared as a ‘gift’ exceeds the duty free limit, Spanish customs may levy duty and tax on the consignments full value. As well as the mainland, Spain consists of the Balearic Islands in the Mediterranean, the Canary Islands in the Atlantic Ocean, off the African coast, and also Ceuta and Melilla, two autonomous cities in North Africa bordering Morocco, plus other smaller territories. It is a country rich in history and full of wonderful cultural sites. You won’t be short of things to do, from hiking and extreme sports holidays to relaxing summer-long breaks on its beautiful coastline. Spain is a popular choice for many in Europe looking for a short break away. Spanish is the country’s main language, but English is also spoken, especially in tourist areas. For those looking to stay in the country for a while, learning the local language is recommended as the population is ferociously protective of their culture. Some of the most popular destinations are those offering summer sun and sunbathing, including Tenerife, which is part of the Canary Islands, Majorca, one of the Balearic Islands and the Costa del Sol on the mainland coast. City breaks can be enjoyed in the cosmopolitan cities of Barcelona and Madrid. Rural tourism in Andalucía is also becoming more popular as people look to get away from the hustle and bustle of the traditional tourist resorts, for a real taste of Spain.